If you close your eyes, chances are you can remember the first time you rode a bike. Maybe it had a banana seat or a super hero on it or maybe you just remember the thrill of flying down the street for the first time. It’s that emotional connection that led Variety Children’s Charity to focus its efforts on making that thrill a reality for kids with disabilities. 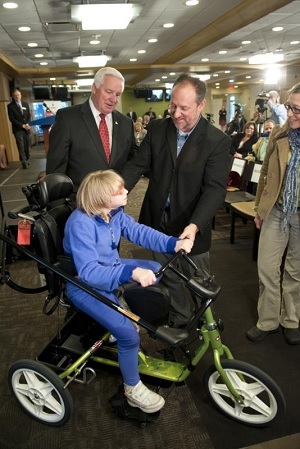 Variety Children’s Charity is based in Pittsburgh and has a long history of helping children, but when the opportunity to provide adaptive bikes for children in Pennsylvania and West Virginia came about, it was a new beginning for the charity. The “My Bike” program began in 2012, providing adaptive bikes to those who have a physical, mental, or sensory disability, which would prevent them from riding a traditional bike. Since then, the program has provided over 500 bikes to kids in 15 Western Pennsylvania counties and has recently expanded to include10 counties in West Virginia. The “My Bike” program will be riding though Bridgeport on July 31, stopping at the Bridgeport Conference Center at 3 p.m. to present bikes to 15 area children. Lisa and Andy Lang spearheaded the local collection of funds that made these bike donations possible. Each bike costs about $1800 to custom fit the child. Special features are in place for the unique needs of the child, such as neck, head, leg and back support. The Langs have been longtime supporters of the work Mike and Kim Martin have done with the Challenger League. Challenger is a division of Little League geared specifically toward children with special needs and was set up locally by the Martins. The bikes take about six weeks to create, with custom fittings and consideration of the individual’s needs. In order to qualify for a bike, applicants must be 21 or younger, meet income guidelines, fill out an application on www.varietypittsburgh.org, and have a letter from a physical or occupational therapist noting the therapeutic benefit for the child. 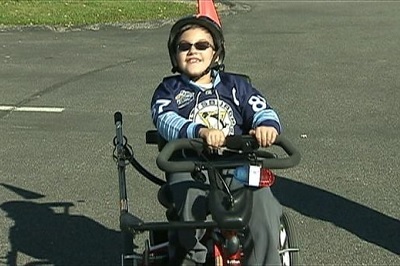 Noah Ash of Clarksburg will be receiving the 50th bike in West Virginia on Thursday. "He is so excited," said his mother Heather Ash. "He has already started to wear his helmet around and anticipating what it will be like to ride along with his friends and siblings." Ash, who suffers from spina bifida, will be fitted for a bike that will allow him to use his legs for the first time. His family praises God for orchestrating the chain of events that led up to this moment. For kids who struggle to skip, run or even walk, the adaptive bike is a life changing experience. It not only affects the child receiving the bike, but also the entire family and community. The bikes give mobility, confidence, and independence to the recipients and help them to feel accepted and included.